Mutator VR uses the HTC Vive virtual reality headset which provides room-scale tracking, two wireless hand-held controllers, and two channels of audio. Graphics are rendered in real-time on an Nvidia GeForce GTX 1080. 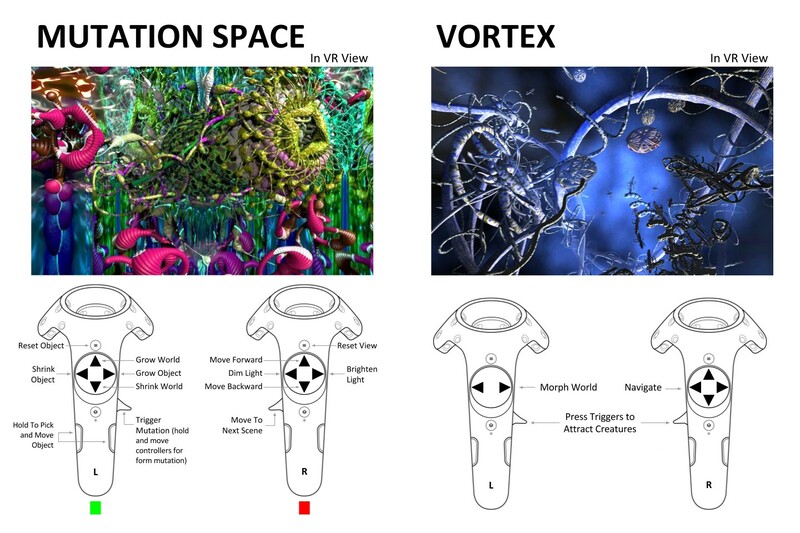 Mutator VR allows the user to take part in the experience by granting interactive control of the forms, system dynamics, and environment. The virtual scenes are entirely procedurally generated from mathematical rules and can be morphed continuously from one to the next. This means each experience of Mutator VR is truly unique and the user is free to explore an endless array of unseen and unheard worlds. Todd, S. and Latham, W.
Inclusion of work in Art Books. “When the Machine Made Art”. “New Media in Late 20th-Century Art”. “Out Of Control. The New Biology of Machine.